I'm all fired up about carbs these days. It started with a meme I saw (and re-posted) on Instagram a few months ago that said "My WCW (woman crush Wednesday) is any woman who still eats carbs" with an image of women devouring pasta. I laughed when I saw it because carbs are having a bad few years lately. With new books coming out regularly like "Wheat Belly" or "Grain Brain," carbs are being demonized. We're being told by health and nutrition bloggers or gurus that if you want to lose weight, improve your energy, have better digestion, or just improve your health, the carbs have got to go. Yet, is that the truth? Sure, some people do well on a low-carbohydrate diet, but I certainly don't. I eat carbs all day, every day. Of course, I have a pretty balanced diet with fats and proteins too, but I don't follow a restricted carbohydrate diet at all. My clients are pretty terrified of carbs too with fears of weight gain, blood sugar imbalances, and worsening health. 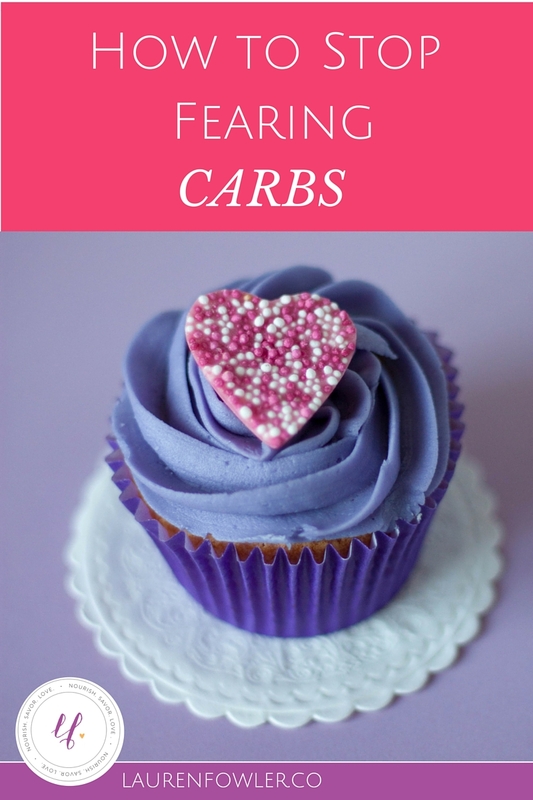 So, I'm here today to breakdown the carb fear and share what the science says and my personal thoughts on carbs (spoiler alert: I love them). Carbohydrates (carbs) are a macronutrient found in foods like grains, starchy vegetables like sweet potatoes, potatoes, squashes, corn, fruit, vegetables, dairy, legumes/beans, and foods like bread, pasta, sweets, and more. While vegetables DO have carbohydrates, I never really consider them a carb source because the energy you use digesting them counters any carbs you would get from them. Carbs often come packaged with fiber and sometimes protein, like in legumes, dairy, or starchy vegetables. In the body, carbohydrates break down to sugars like glucose, fructose, or galactose (the simplest sugars). Don't be scared of the "S" word (sugar) - this is simply the way the body digests and processes carbohydrates. What do Carbs Offer the Body? Fuel! Glucose is the main source of energy for the brain and muscles. Our brains love a good source of glucose, and it keeps the brain running well. Our brains use 25% of our total energy intake - quite a bit for such a small organ! If you've ever been on a low-carb or low-calorie diet, I'm sure you've felt the difference if your ability to focus or mood changes because your brain isn't well-fueled. Fiber! Carbs and fiber come as a wonderful package, offering your cells fuel, as well your friendly gut flora fuel. Starches like beans, roots and tubers, and others provide prebiotics to feed your gut bacteria (probiotics) for healthy digestion. Fiber keeps things moving, and constipation is often a side effect of a low-carb diet. Nutrients! Carbohydrates are a rich source of a variety of vitamins, minerals, and phytonutrients. Now, let's get to the good stuff and all those questions you have about carbs. Yes, actually, carbs are the devil. I actually think it's funny and shocking that there's a book (by a dietitian!) out there titled "Bread is the Devil: Win the Weight Loss Battle by Taking Control of your Diet Demons." Pleaseeee, don't buy it and support the food policing. Now that we got the jokes out of the way, here's the real truth: CARBS ARE WONDERFUL. They are not evil or out to give you diabetes or make you fat. All foods - especially carbs - can fit in a balanced, healthy diet. In fact, our bodies and brains love glucose (carbs). Sure, some carbs will have more nutrients than others, and focusing on a wide variety of carbs like starchy veggies (sweet potatoes, potatoes, squashes, etc. ), grains, beans/legumes, fruit, and more will provide energy, fiber, and nutrients. Refined carbs may have less fiber, vitamins or minerals, or other ingredients. Eating some carbs on their own may lead to blood sugar swings. That may not feel great in your body, and experimenting to figure out what feels good in your body is way better than "quitting" sugar. The biggest thing to keep in mind is refined carbs are not "bad." I don't like the term "clean eating," because it implies that eating processed foods is "dirty" eating, and what does that even mean? Do I eat dirty because I actually love fresh veggies from the garden (from the dirt!)? Anyways, give yourself permission to eat and enjoy whatever food. Sure, you can make decisions from a place of nutrition, but you can also make food decisions based on what you enjoy eating and taste. I love sweet potatoes and chickpeas, but I also love cookies and bread. No need to feel guilty for eating cookies OR "good" for eating sweet potatoes. #2: But, gluten is the devil, right? Welllll...nope again. Sure, for some people, gluten is not a friend, but that's a very small percentage of the population. The research estimates that about 1% of the population has celiac disease (an autoimmune reaction to gluten), and the (very-early) research estimates that 6% of the population has a non-celiac gluten sensitivity. When I see clients with food sensitivities, it's not always gluten or dairy. There is a lot to consider, but gluten isn't destroying everyone's health. Many people also think that food is causing digestive symptoms, but it's important to consider stress, anxiety, or other factors. It's also important to make sure you're eating enough - and enough carbs - before blaming food sensitivities like gluten. #3: But the healthiest people eat low-carb right? I find it super interesting that the Blue Zones - where there are some of the longest living and healthiest populations in the world currently - all eat plenty of carbs with plenty of grains and beans too. The research on ancestral diets also suggests that they DID eat grains and legumes, contrary to what you'll read in a Paleo book. Carbohydrate restriction may also increase cortisol (stress hormones) and impact thyroid health, especially for active people. Women's hormones appear more sensitive to carb restriction and may impact fertility and hormonal balance. From a nutritional standpoint, I always encourage my clients to vary their carbohydrate sources, such as an array of whole grains (buckwheat, oats, quinoa, wild rice, etc. ), beans/legumes, fruit, starchy veggies and tubers, crackers, chips, and more. I also help them create balanced meals with protein and fats and listen to their body. Most people have no need to restrict carbohydrates when they're doing that because they're getting a balanced amount of macronutrients, a varied diet without unnecessary restrictions, and find that their body actually feels great while eating carbs. If you're fearing carbs, give them a chance again. Give yourself permission to enjoy the carbs you have been restricting. Allow yourself the time to get used to them again. At first, you may eat them and freak out. Be aware of those fears and the mindset. Can you take a non-judgmental approach while eating them? By that, can you look at the bigger picture and realize that having one cookie is not really a big deal or going to impact your life - and actually by eating it, you may add a bit of enjoyment to your day? Notice how you feel in your body, but be sure not to obsess over or 'blame' carbs if you feel tired or bloated. It could be from the food, or it could be because it's normal to feel bloated at times or could be something unrelated to carbs. If you are going to pay attention to how your body feels, notice both positive or negative changes. Have fun with carbs. Find some new recipes that use unique whole grains like black rice or starches like purple sweet potatoes. There's a whole lot more to carbs than just brown rice and whole wheat bread. Get rid of your low-carb books or unfollow health "gurus" on social media that are carb fear-mongerers. There's a big difference between some health practitioners that promote open conversation on topics compared to others who are more closed-minded and use fear-based tactics. Go buy a sandwich or cookie or whatever carb is calling your name. Eat it. Move on to the rest of your day. Work with a coach (like myself) to move towards intuitive eating and get out of the diet mindset! *No need to fear ANY macronutrient - carb, protein, or fat. All are delicious, nutritious, and important to the body.